Tis the season of celebrating, eating a little too much and of course, being with our loved ones. In order to end 2015 with a bang (and start the New Year off just right), our holiday newsletter is filled with a ?must have? survival guide for weight loss, amazing recipes and some beautiful gift giving ideas. From blessing baskets to natural candles and beautiful mediation necklaces, our goal is to help you get a little more balance and joy in your every day. Looking to survive the holidays in a healthy way without gaining weight? Look no further - check out my holiday survival guide here. HAPPY 10-YEAR ANNIVERSARYSHULMAN WEIGHT LOSS! 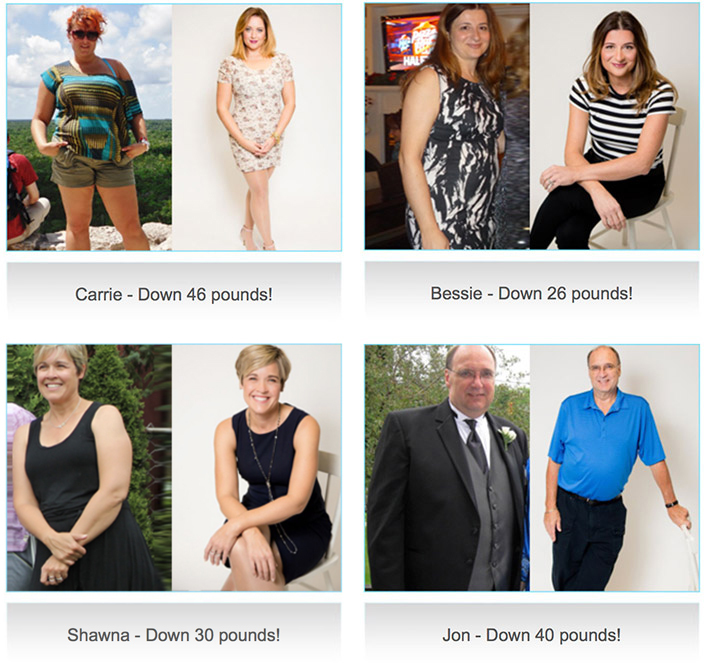 As of January 2016, Shulman Weight Loss celebrates our 10-year anniversary! We are now 3 locations strong and growing. It has been our honor to help so many people lose the weight and... live their life. Stay tuned for some amazing savings at the beginning of the New Year. Apparently elephants with their trunks up are good luck! 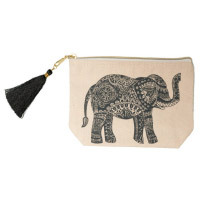 This is one of the many reasons these beautiful mini pouches by Dialogue Projects are a great gift. Proceeds from these mini make up bags go towards the National Alliance on Mental Illness, which provides support, education and advocacy for families and those living with mental illness. Simply stated, mala beads are a set of beads that have been traditionally used in prayer and mediation (often called prayer beads). 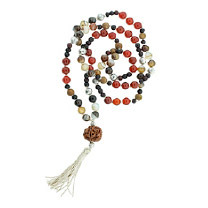 This vibrant, beautiful mala symbolizes positive energy and awakens creativity. It is made of carnelian stones, agate, sandalwood and rosewood and it is the perfect gift for those on your list who are looking for balance, focus, love and joy. All mala's are handcrafted by the Garhwali women of the Himalaya's with proceeds going towards improving the lives and education of women and children. I featured Blessing Baskets last year and must do it again as I am such a fan. The Blessing Basket Project was firs founded by Theresa Carrington to help end poverty in developing countries. 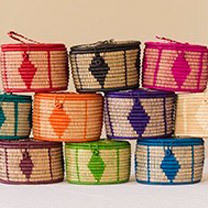 By purchasing a blessing basket, you empower families around the world not to just exist, but to thrive. Artisans are paid prosperity wages (2.5x fair trade for their handcraft). Your blessing basket product was carefully and skillfully handcrafted by a blessing basket artisan half a world away. 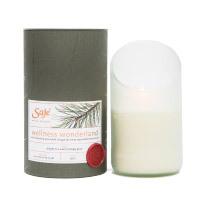 This 100% natural, aromatherapy soy wax candle is the perfect holiday gift for anyone on your list. It is made with soy wax and essential oils of cedarwood, pine Siberia, patchouli, elemi, eucalyptus, orange and vetiver. The candle lasts for 45 hours and once finished, the white-frosted, recovered glass candle-holder can be used as a plant vase or pretty decorative piece. The wicks are 100% cotton, and are lead, bleach and chemical free. All Saje beauty and houseware products are 100 percent natural and can be found at www.saje.ca. 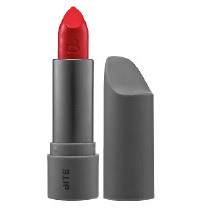 This bright and vibrant lipstick is fun for the holiday season and is the perfect stocking stuffer! All Bite products are made in downtown Toronto and driven by the philosophy that "you eat what you put on your lips, so your lipstick should be good for you". All products are made with food-grade, antioxidant rich ingredients and are made in small batches so natural benefits and organic ingredients are retained during the process. One of my dear friends from Cityline wrote a book that combines two of my favorite things - Canada and natural health. 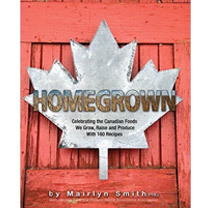 Homegrown, by Marilyn Smith proves that Canada really can be the main ingredient in any meal. From hearty stew from Saskatchewan to Nova Scotia scallops - this recipe book is filled with some natural goodness you will not resist. To top it off, Homegrown also includes a carb counter and nutritional information with each and every recipe. In food processor drop prunes and dates through the feed hole one by one. Scrape the processor bowl and run until the prunes and dates are smooth. Add remaining ingredients except for the coconut. Run until smooth and scrape bowl as needed. 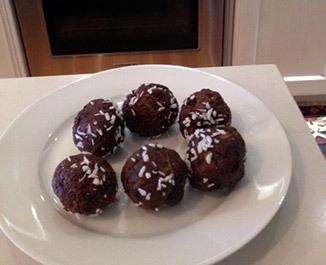 Roll the mixture into 12 one-inch balls and roll in coconut (or crushed almonds) to coat. In a small bowl, whip the eggs, cinnamon and nutmeg. Coat a skillet with coconut oil and set to medium heat. Dip the bread into the egg mixture (make sure to get both sides) and cook for 2 minutes per side, or until crisp. Drizzle with maple syrup or add a dollop of vanilla Greek yogurt for some protein. In food processor, process walnuts, flax, lemon rind, oil, dill, salt and pepper using pulsing action until crumbly (mixture should slightly stick together). Set aside. Place salmon fillets on plate (skin side down) and brush tops with mustard. Divide crust mixture evenly among the fillets and press onto the mustard. Allow prepared fish to sit in fridge for at least 15 minutes and up to 2 hours. Bake in 350 F oven for about 15 minutes or until salmon flakes with a fork. Drizzle with lemon juice or serve with lemon slices. Add vegetables to a large pot and cover with water. Bring to a boil and then lower heat and simmer, covered, for 10 minutes, until vegetables are tender. Drain water and reserve at least 1 cup of liquid. Mash vegetables adding a splash of water as needed. Add dill, salt and pepper, to taste. Preheat your oven to 350°F / 175°C. Combine all the ingredients, except for the chocolate chips, in a food processor and process until very smooth, scraping the sides and the top to get the little chunks of chickpeas and process again until they're combined. Put in the chocolate chips and stir it if you can, or pulse it once or twice. The mixture will be very thick and sticky. With wet hands, form into 1 1/2" balls. Place onto a piece of parchment paper. If you want them to look more like normal cookies, press down slightly on the balls. They don't do much rising. Bake for about 10 minutes. Yields about fourteen 1 1/2" cookie dough balls. Stay hydrated - Thirst can often be mistaken for hunger so make sure you stay nice and hydrated with pure water and herbal teas throughout the day. Minimize treats - Eat like the French this holiday season. Allow yourself to sample some of your favorite treats- but make your sample sizing a little smaller! Limit alcohol - Have wine spritzers or replace a third glass of alcohol with a glass of bubbly water. Plan your indulgences - What is your favorite food to indulge in this time of year? Make a mental plan on where and how you are going to indulge prior to attending your big family meal.